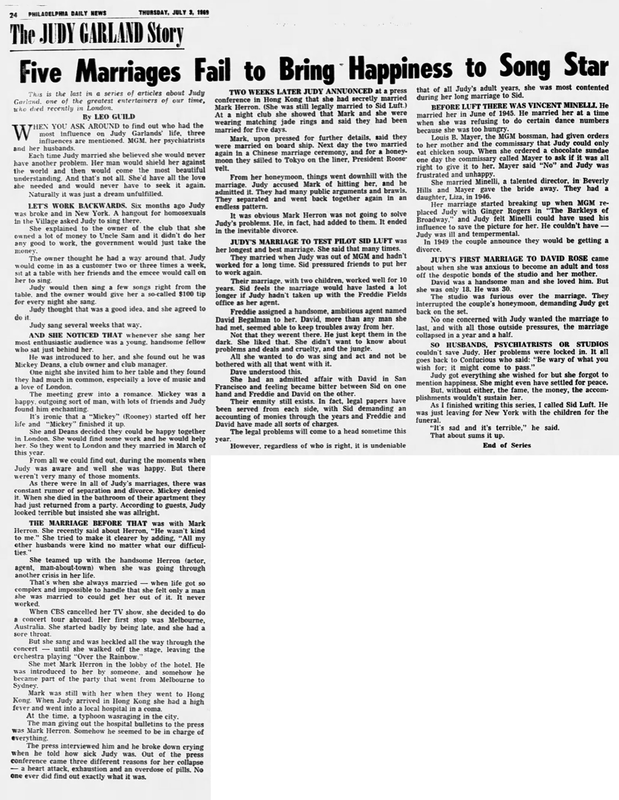 June 3, 1939: Here is another article about the production of The Wizard of Oz allegedly written by producer Mervyn LeRoy. See yesterday’s post for the another LeRoy article. 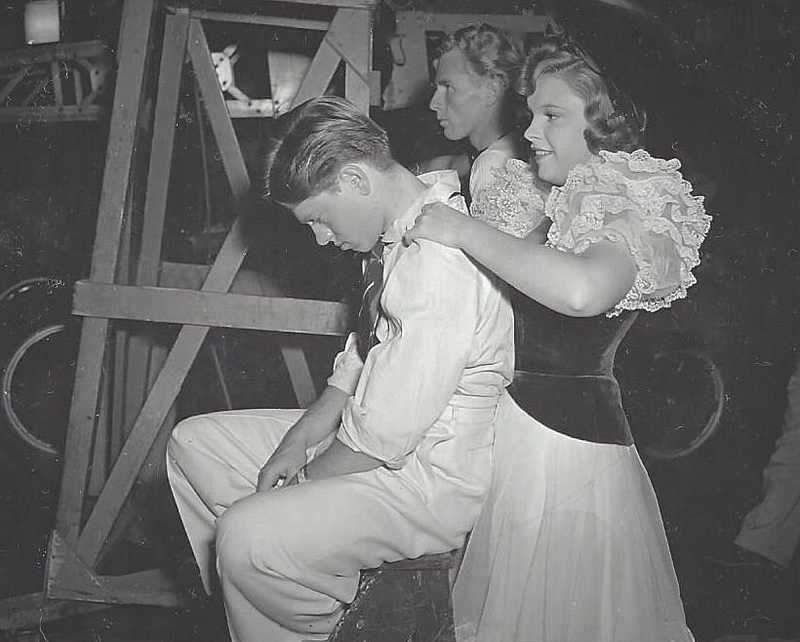 Also on July 3, 1939: Judy and Mickey Rooney and the rest of the cast of Babes in Arms continued filming on the “Minstrel” number on the “Exterior Barn Theatre” set. 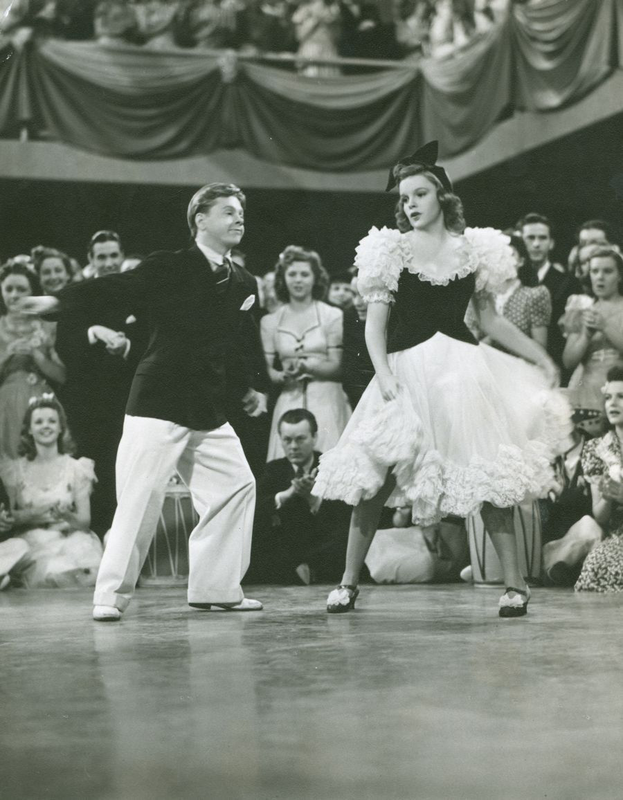 It was a long day, with Judy having a call to be on the set at 9 a.m. (which meant she had to be in makeup at least an hour earlier); lunch: 12:20-1:30 p.m.; dismissed: 6 p.m.
July 3, 1940: The final day of filming the extensive “La Conga” number for Strike Up The Band on the “Interior Gym” set. Time called: 9 a.m.; dismissed: 11:10 p.m. To this day the number is still one of the most exciting and sizzling numbers ever put on screen. 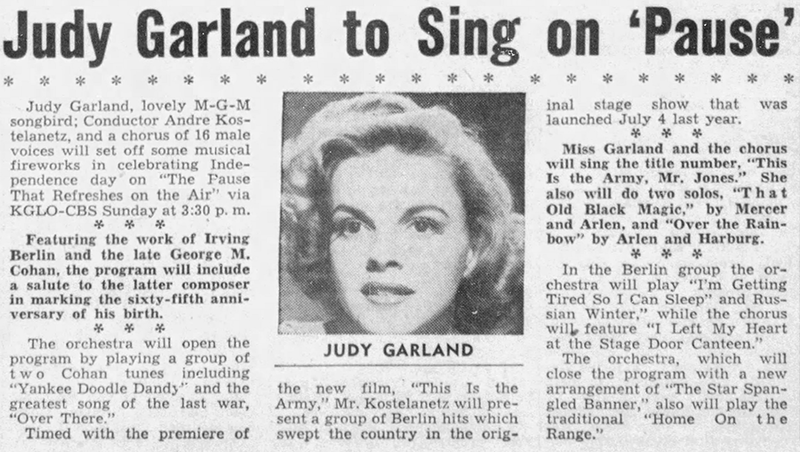 July 3, 1943: Here’s an article in advance of the upcoming (July 4) CBS Radio show “The Pause That Refreshes On The Air” featuring Judy and Andre Kostelanetz who had just conducted for Judy for her July 1 concert debut at the Robin Hood Dell in Philadelphia. 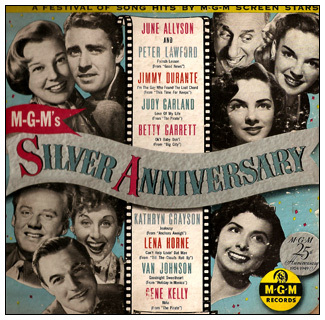 July 3, 1949: In celebration of the 25th anniversary of MGM, MGM Records released an album aptly titled “Silver Anniversary” which was their first compilation of songs from their musicals. 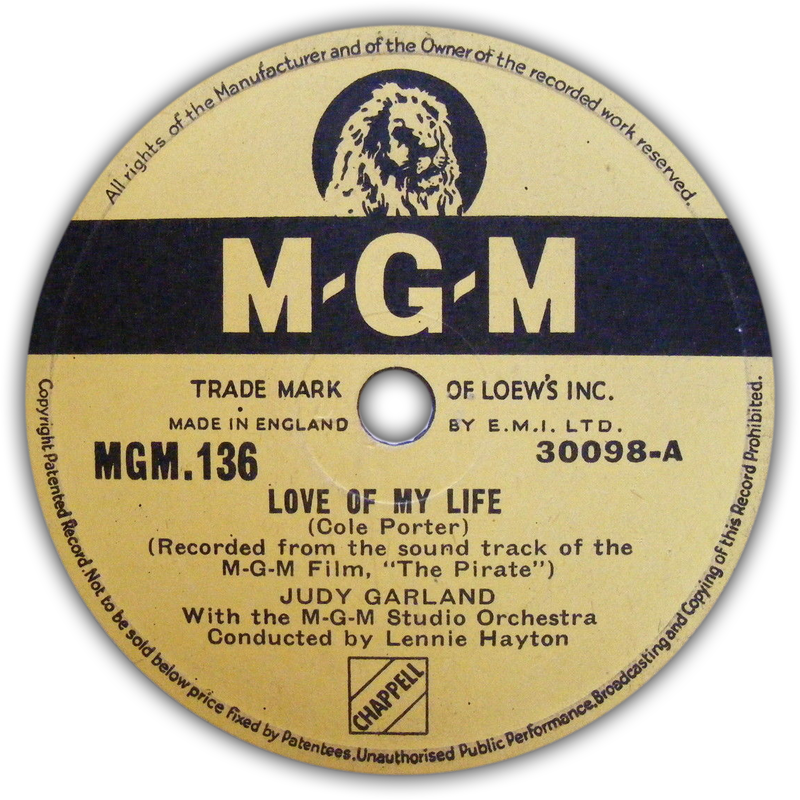 The one Judy number (the album was four records, eight sides (songs), only which was standard for the day) was “Love of My Life” from The Pirate (1948). 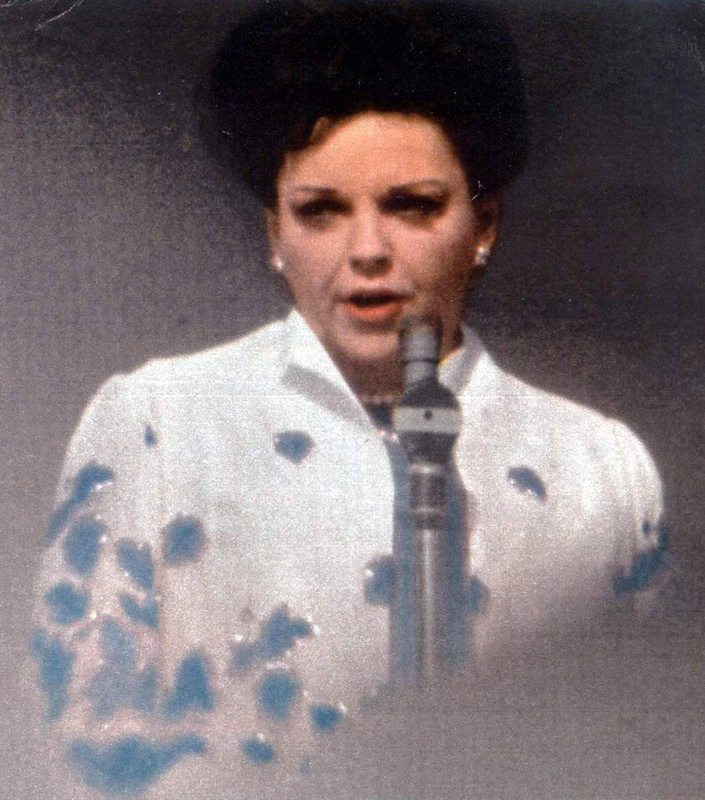 Check out The Judy Garland Online Discography’s Silver Anniversary page here. 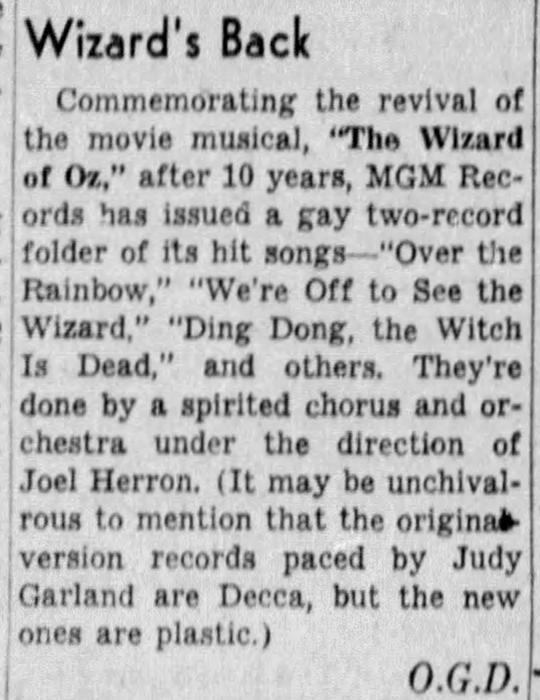 Also noted on this day was the release of an MGM Records album of songs from The Wizard of Oz to coincide with the recent re-release of the film in theaters. 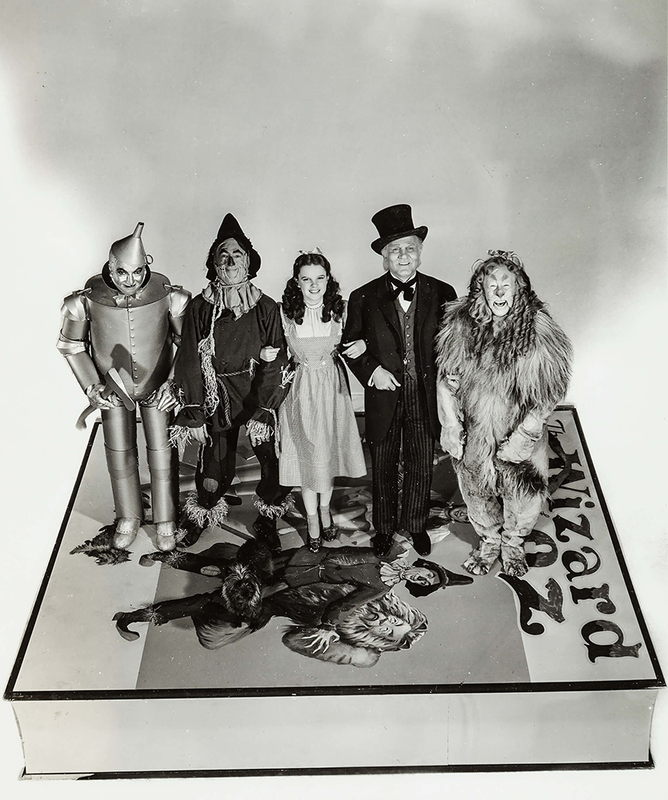 The album was not the film soundtrack, MGM Records didn’t release that until 1956, it was a short collection of choral renditions of the film’s best-known songs. The reason for this is that MGM, actually no label, had come up with the idea to transfer songs and dialog directly from the soundtrack of the films made prior to then the label was created and prerecordings were remixed for release on albums. 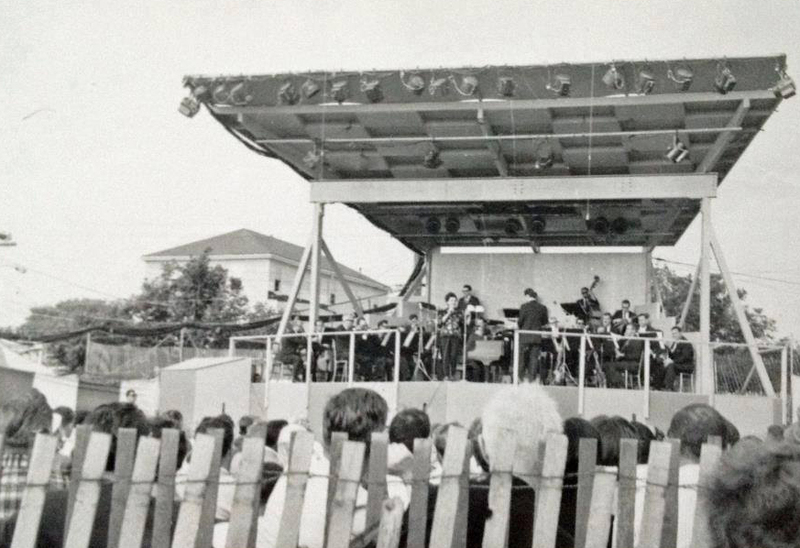 July 3, 1954: Another day of filming on the “Interior Stage & Backstage” set for the “Born In A Trunk” sequence in A Star Is Born, specifically the “Swanee” number. 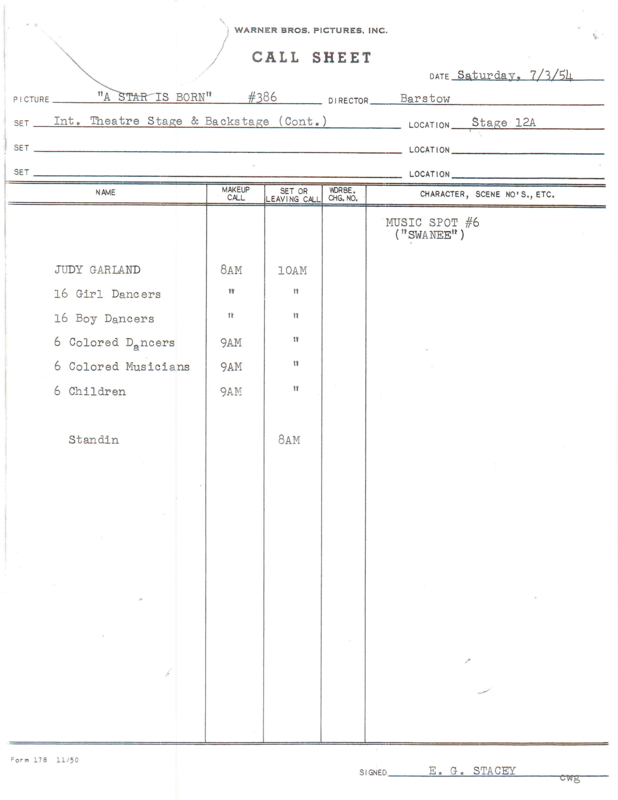 As this Call Sheet shows, Judy was due in makeup at 8 a.m., due on the set at 10 a.m. The assistant director’s notes state that shooting began at 11:45 a.m.; finished at 4:15 p.m. They also state Garland resting 3:20-3:55 p.m.; Garland left stage – too tired to continue at 3:55 p.m. 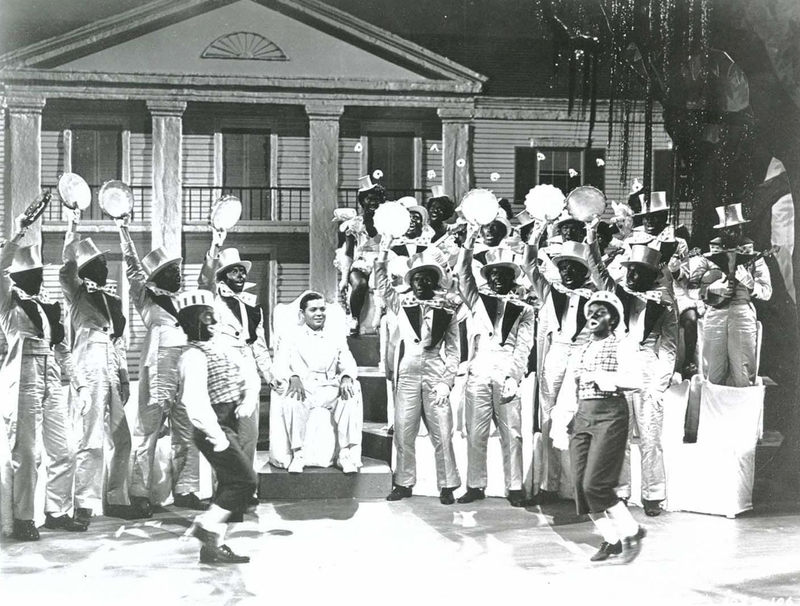 Note that the director is “Barstow” who was Richard Barstow, the dance director on the film, not the film’s director, George Cukor. 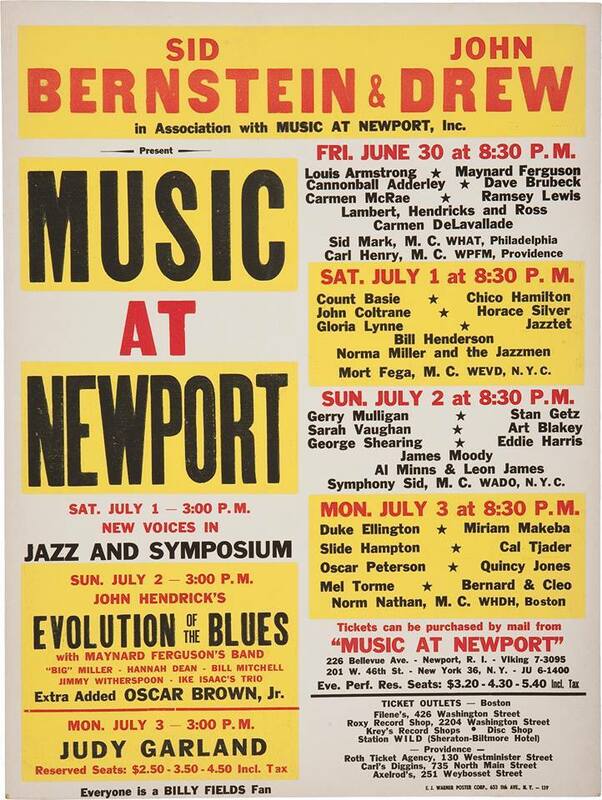 A special thanks to Alan Herskowitz for providing the scan of the call sheet. Thank you, Alan!! 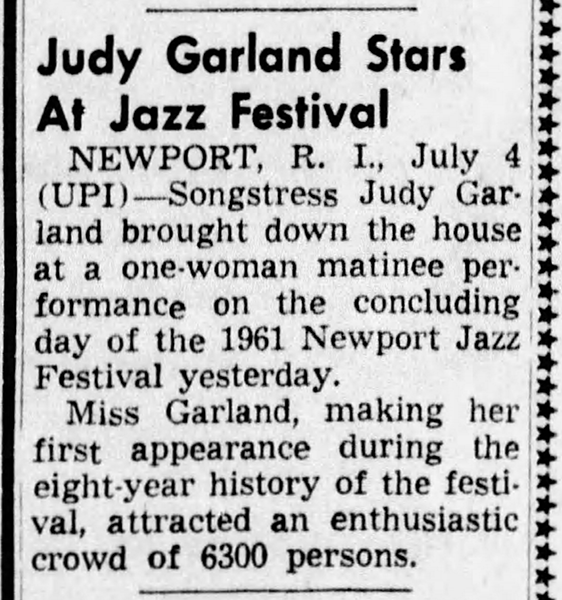 July 3, 1955: “Judy Garland Has a Date With You!” Judy’s upcoming show at the Long Beach Municipal Auditorium was generating tons of advance buzz, including this article published in the Long Beach Independent Press Telegram. 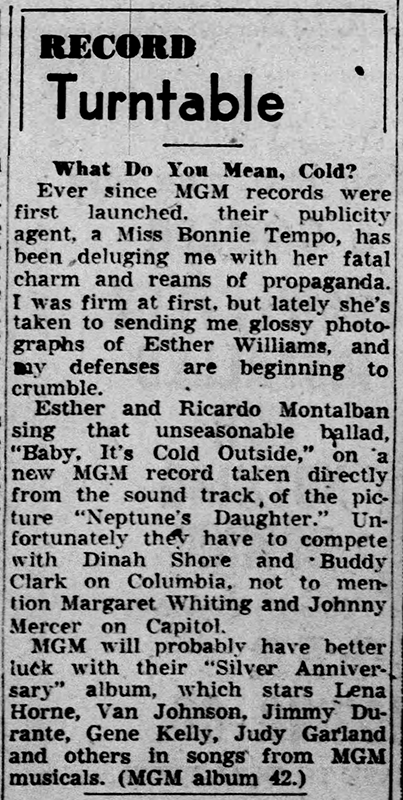 It’s interesting that the subtitle of the article is “Frank and Ethel Gumm’s Girl.” Most articles, even those that chronicle Judy’s childhood, didn’t put her parent’s names in the title. What’s of interest here is the box that gives “Facts About the Show” featuring ticket prices and details about the charity the show was benefitting, the Exception Children’s Foundation. 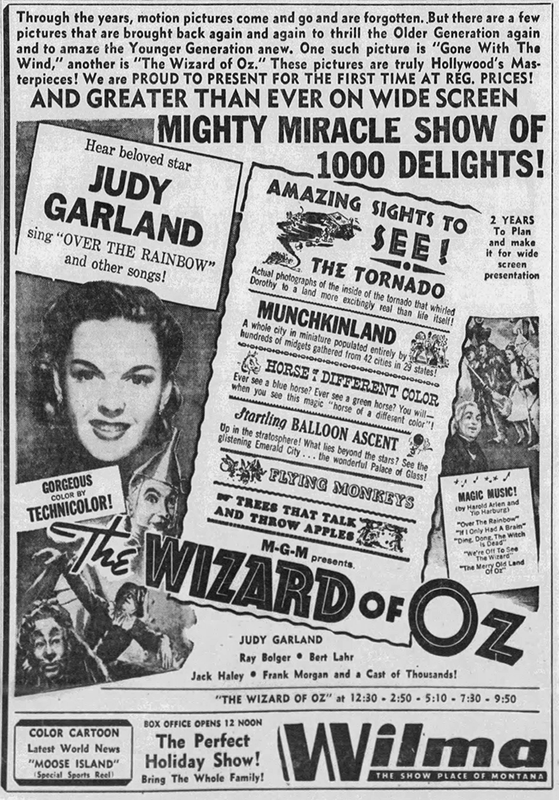 July 3, 1955: Here’s another fun advertisement for the re-release of The Wizard of Oz in theaters. 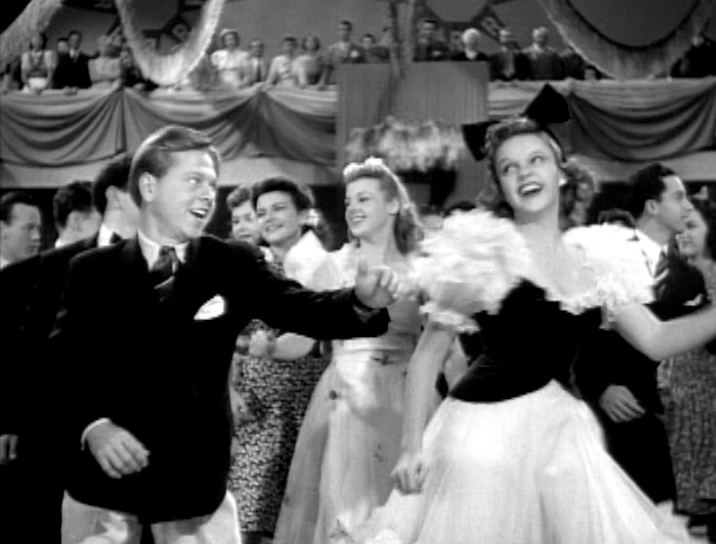 This re-release was being promoted as the first time the film was being presented in “widescreen” which meant that unfortunately the film was cropped at the top and bottom of the frame to create a faux widescreen version. Luckily that trend didn’t last. 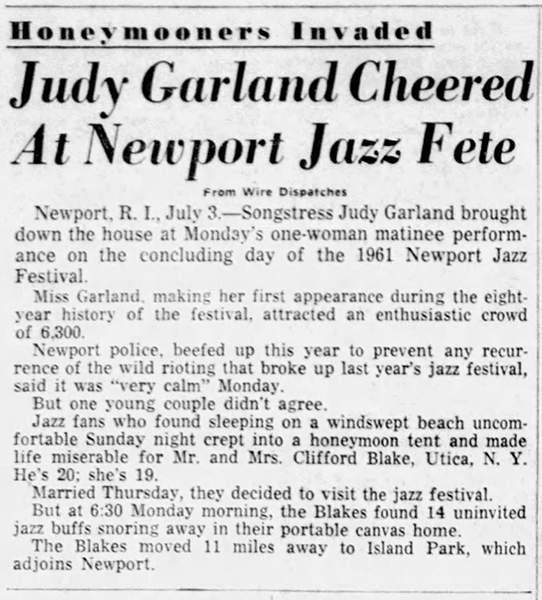 July 3, 1961: Judy appeared at the “Music at Newport” Jazz Festival in Newport, Rhode Island. 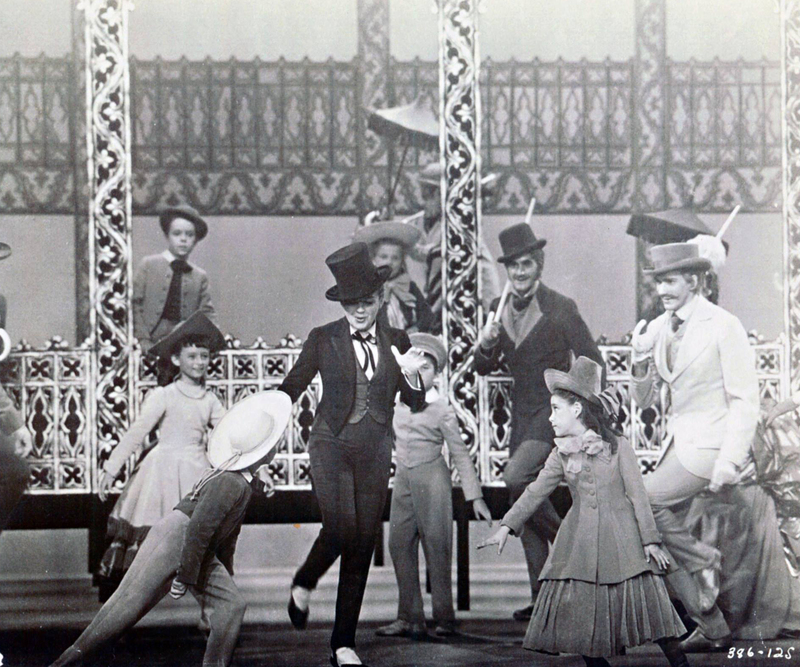 It was a matinee show and grossed $25,000. 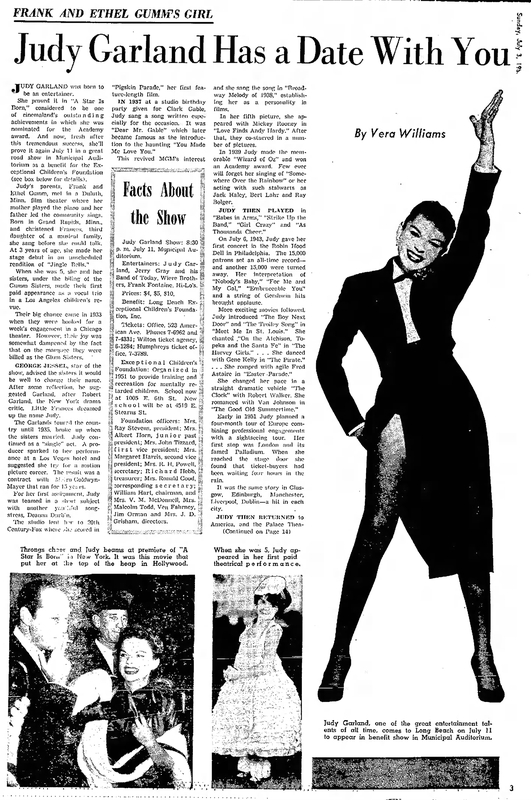 Judy wore an outfit that she designed herself, which is the first known outfit that she executed on her own. 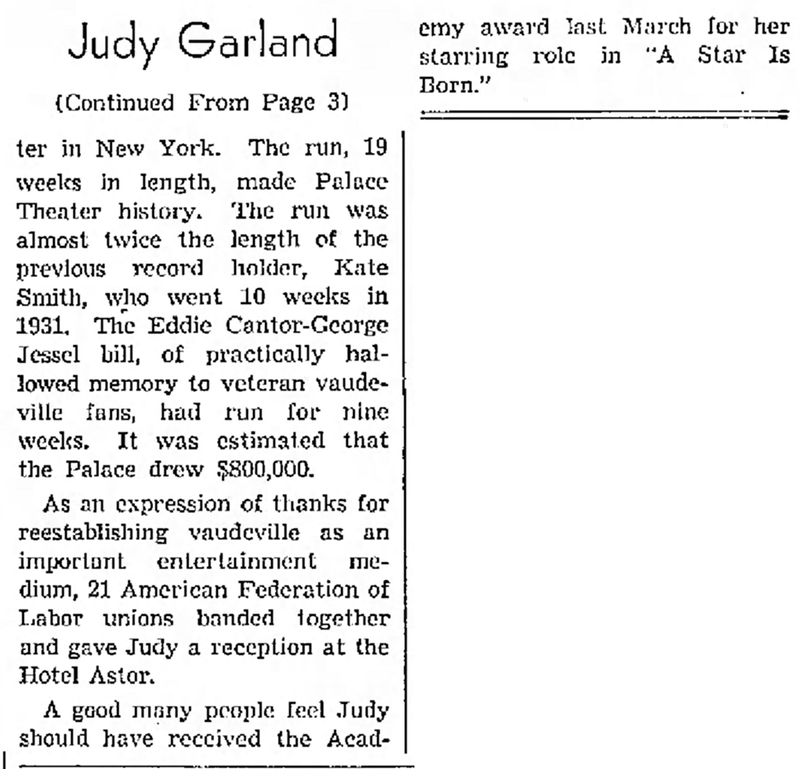 July 2, 1969: The last in a series of articles about Judy published immediately after her death. 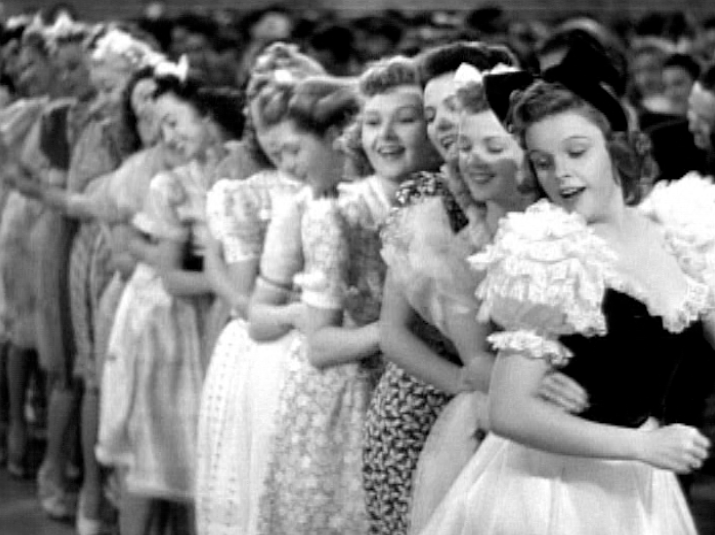 WHEN YOU ASK AROUND to find out who had the most influence on Judy Garland’s life, three influences are mentioned. MGM, her psychiatrists, and her husbands. Each time Judy married she believed she would never have another problem. Her man would shield her against the world and then would come the most beautiful understanding. And that’s not all. She’d have all the love she needed and would never have to seek it again. Naturally, it was just a dream unfulfilled. LET’S WORK BACKWARDS. Six months ago Judy was broke and in New York. A hangout for homosexuals in the Village asked Judy to sing there. She explained to the owner of the club that she owed a lot of money to Uncle Sam and it didn’t do her any good work, the government would just take the money. The owner thought he had a way around that. 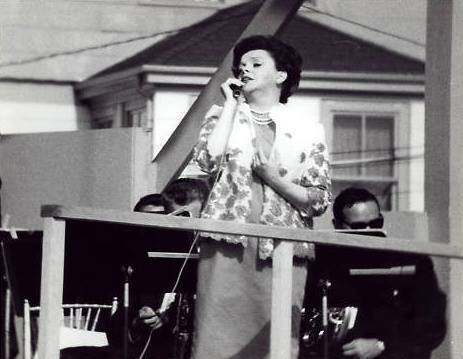 Judy would come in as a customer two or three times a week, sit at a table with her friends and the emcee would call on her to sing. Judy would then sing a few songs right from the table, and the owner would give her a so-called $100 tip for every night she sang. Judy thought that was a good idea, and agreed to do it. Judy sang several weeks that way. 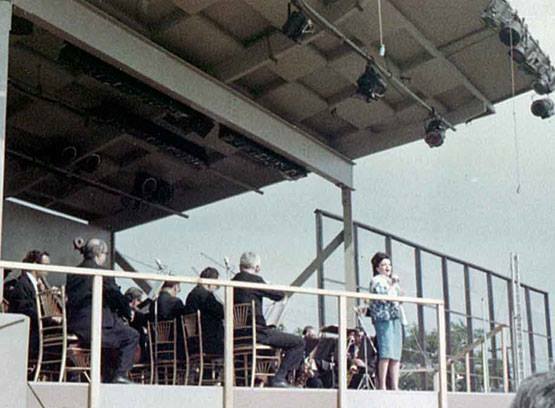 AND SHE NOTICED THAT whenever she sang her most enthusiastic audience was a young, handsome fellow who sat just behind her. He was introduced to her, and she found out he was Mickey Deans, a club owner, and club manager. One night she invited him to her table and they found they had much in common, especially a love of music and a love of London. The meeting grew into a romance. 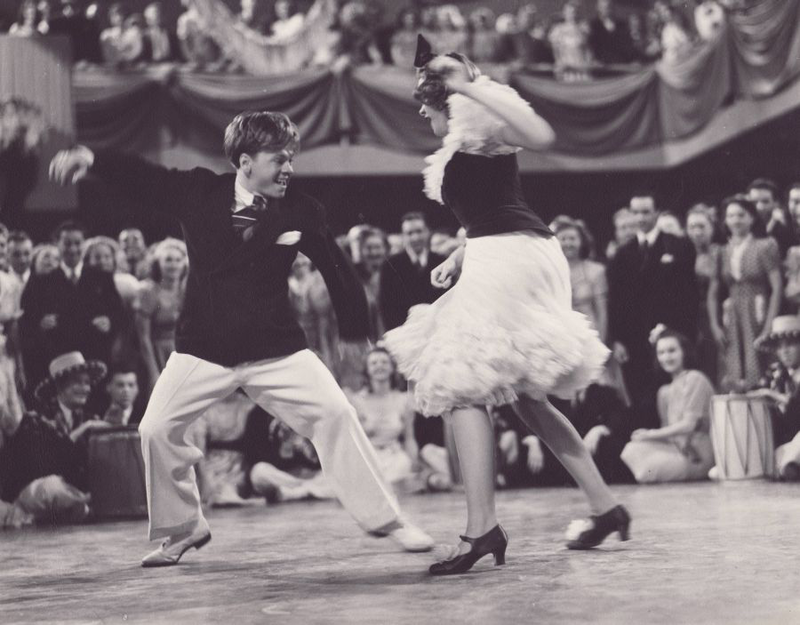 Mickey was a happy, outgoing sort of man, with lots of friends and Judy found him enchanting. It’s ironic that a “Mickey” (Rooney) started off her life and “Mickey” finished it up. She and Deans decided they could be happy together in London. She would find some work and he would help her. So they went to London and they married in March of this year. From all we could find out, during the moments when Judy was aware and well she was happy. But there weren’t very many of those moments. As there were in all of Judy’s marriages, there was constant rumor of separation and divorce. Mickey denied it. When she died in the bathroom of their apartment they had just returned from a party. According to guests, Judy looked terrible but insisted she was alright. he teamed up with the handsome Herron (actor, agent, man-about-town) when she was going through another crisis in her life. That’s when she always married – when life got so complex and impossible to handle that she felt only a man she married to could get her out of it. It never worked. When CBS canceled her TV show, she decided to do a concert tour abroad. Her first stop was Melbourne, Australia. She started badly by being late, and she had a sore throat. She met Mark Herron on the lobby of the hotel. He was introduced to her by someone, and somehow he became part of the party that went from Melbourne to Sydney. Mark was still with her when they went to Hong Kong. When Judy arrived in Hong Kong she had a high fever and went to a local hospital in a coma. At the time, a typhoon was raging in the city. The man giving out the hospital bulletins to the press was Mark Herron. Somehow he seemed to be in charge of everything. The press interviewed him and he broke down crying when he told how sick Judy was. Out of the press conference came three different reasons for her collapse – a heart attack, exhaustion and an overdose of pills. No one ever did find out exactly what it was. 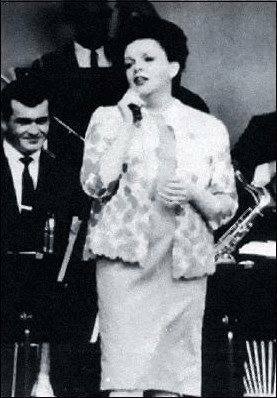 TWO WEEKS LATER JUDY ANNOUNCED at a press conference in Hong Kong that she had secretly married Mark Herron. (She was still legally married to Sid Luft). At a nightclub, she showed that Mark and she were wearing matching jade rings and said they had been married for five days. Mark, upon pressed for further details, said they were married on board ship. Next day the two married again in a Chinese marriage ceremony, and for a honeymoon, they sailed to Tokyo on the liner, President Roosevelt. From her honeymoon, things went downhill with the marriage. Judy accused Mark of hitting her, and he admitted it. They had many public arguments and brawls. They separated and went back together again in an endless pattern. It was obvious Mark Herron was not going to solve Judy’s problems. He, in fact, had added to them. It ended in the inevitable divorce. JUDY’S MARRIAGE TO TEST PILOT SID LUFT was her longest and best marriage. She said that many times. They married when Judy was out of MGM and hadn’t worked for a long time. Sid pressured friends to put her to work again. Their marriage, with two children, worked well for 10 years. Sid feels the marriage would have lasted a lot longer if Judy hadn’t taken up with the Freddie Fields office as her agent. Freddie assigned a handsome, ambitious agent named David Begalman to her. David, more than any man she had met, seemed able to keep troubles away from her. Not that they weren’t there. He just kept them in the dark. She liked that. She didn’t want to know about problems and deals and cruelty, and the jungle. All she wanted to do was sing and act and not be bothered with all that went with it. 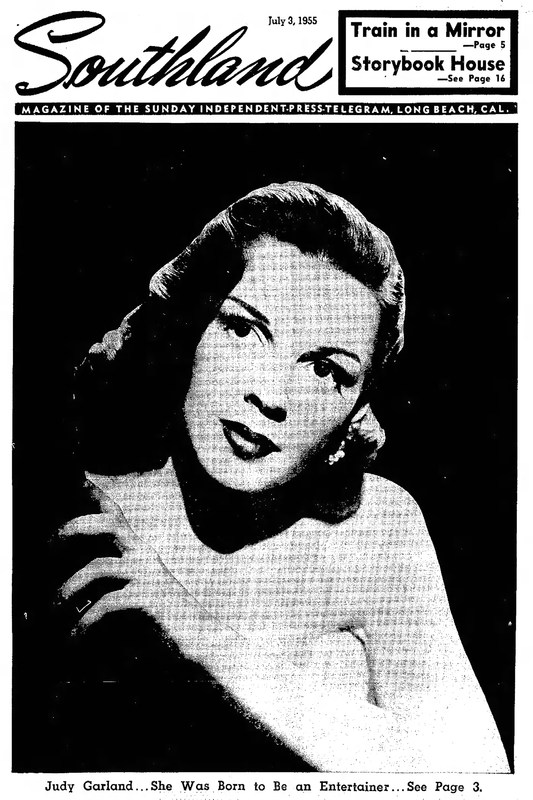 She had an admitted affair with David in San Francisco and feeling became bitter between Sid on one hand and Freddie and David on the other. Their enmity still exists. In fact, legal papers have been served from each side, with Sid demanding an accounting of monies through the years and Freddie and David have made all sorts of charges. The legal problems will come to head sometime this year. However, regardless of who is right, it is undeniable that of all Judy’s adult years, she was most contented during her long marriage to Sid. BEFORE LUFT THERE WAS VINCENTE MINNELLI. He married her in June of 1945. He married her at a time when she was refusing to do certain dance numbers because she was too hungry. Louis B. Mayer, the MGM bossman, had given orders to her mother and the commissary that Judy could only eat chicken soup. When she ordered a chocolate sundae one day the commissary called Mayer to ask if it was all right to give it to her, Mayer said “No” and Judy was frustrated and unhappy. She married Minnelli, a talented director, in Beverly Hills, and Mayer gave the bride away. They had a daughter, Liza, in 1946. 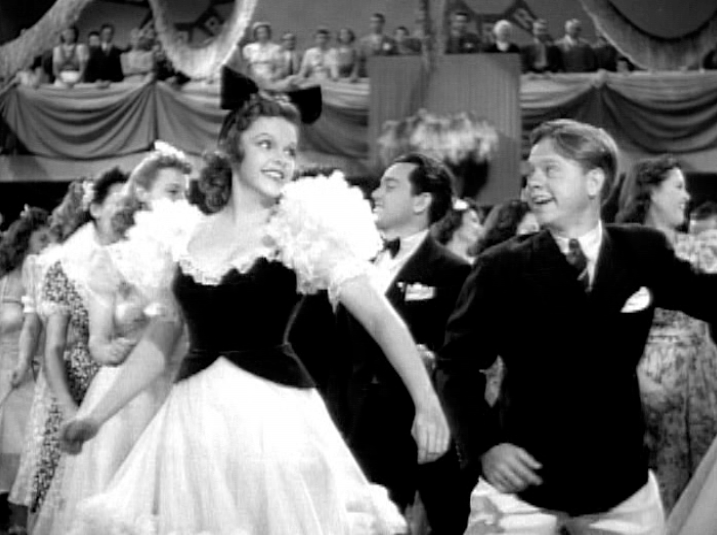 Her marriage started breaking up when MGM replaced Judy with Ginger Rogers in “The Barkleys of Broadway,” and Judy felt Minnelli could have used his influence to save the picture for her. He couldn’t have – Judy was ill and temperamental. In 1949 the couple announced they would be getting a divorce. JUDY’S FIRST MARRIAGE TO DAVID ROSE came about when she was anxious to become an adult and toss off the despotic bonds of the studio and her mother. David was a handsome man and she loved him. But she was only 18. He was 30. The studio was furious over the marriage. They interrupted the couple’s honeymoon, demanded Judy get back on the set. No one concerned with Judy wanted to marriage to last, and with all those outside pressures, the marriage collapsed in a year and a half. Judy got everything she wished for but she forgot to mention happiness. She might even have settled for peace. But, without either, the fame, the money, the accomplishments wouldn’t sustain her. As I finished writing this series, I called Sid Luft. He was just leaving for New York with the children for the funeral. “It’s sad and it’s terrible,” he said.